Employee absenteeism can be particularly challenging and time consuming for Christian charity leaders to manage. Of course this isn’t an issue limited to the charitable sector. The Conference Board of Canada reported that the average absence rate among Canadian employers in 2015 was 8.9 days per full time employee, and that absenteeism cost the Canadian economy approximately $16.6 billion in 2012. While managers working in corporate settings typically receive training on managing absenteeism, and have established policies and third party specialists to help guide them, these resources are often not available to charity leaders. This can make it difficult to know how to respond appropriately when a employee provides a doctor’s note indicating that they are to remain off work until further notice. And while more complex cases will require professional guidance, there is still much that charities can do to appropriately manage absenteeism within their organizations. 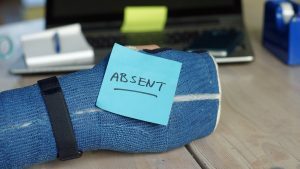 While there are different kinds of absenteeism, this blog post will focus on employee absences or requests for accommodation that are not due to a work related injury or illness. These non-occupational absences are sometimes referred to as innocent absenteeism, as they are outside the employee’s power to control, and would not be subject to discipline. Although innocent absenteeism is considered to be outside of the employee’s power to control, charities should still seek to actively manage these absences, and employees still have an obligation to participate in the attendance management or return to work programs of their employer. (Note: if any of the charity’s employees are represented by a union, the leader should consult the collective agreement to see if any special rules apply). Touch base with the employee at regular intervals and keep the lines of communication open. Lengthy absences can cause employees to feel disconnected from what is happening at work and anxious about the prospect of returning. Some employees may appreciate being kept updated on workplace happenings and social events. These conversations are also a good time to make the employee aware of the charity’s Employee Assistance Program (EAP), if one exists. Letting the employee know that you are coming from a position of care and support demonstrates goodwill, and can be a positive way to initiate the conversation, especially in situations where the employment relationship is less than ideal. Requesting clarity with regards to the employee’s functional abilities (e.g. sitting, standing, ability to concentrate etc.) so the charity can identify and offer the employee modified work that is appropriate. A job description or physical demands analysis (if one exists) can also assist the health care provider in making appropriate recommendations with regards to modified work. Asking about an employee’s diagnosis or treatment is not relevant to managing the absence, and could actually expose the charity to a human rights complaint. If the employee divulges this information, let them know that it is not required and redirect the conversation to identifying work they might still be able to perform. At minimum, the doctor’s note should include the employee’s name, the date they were seen and the signature or stamp of the doctor’s office. It should also indicate a return to work date, or when the employee will be re-assessed, which is typically a good time to request an updated doctor’s note. If the employee wishes to return to full duties before the expiration of the current doctor’s note on file, the charity should request an updated doctor’s note clearing the employee to do the same. If the employee resumes work before they are ready or outside of the parameters set by their health care provider, it could have long term health consequences for the employee, and expose the charity to additional liability. If the charity has requested details about the employee’s functional abilities, the health care provider may charge the employee a fee for this documentation. This can be difficult from an employee relations perspective as the employee may be on a reduced or fixed income. For these reasons, and because the charity has initiated the request for this additional information, charities should consider reimbursing the employee for part or all of these costs. Be sure to document any offers of modified work. If the charity is able to identify work that is within the restrictions identified by the employee’s health care provider, it should offer that modified work to the employee in writing. For the return to work to be successful, the employee must be an active participant in the process and given the opportunity to provide input as well as raise any concerns they may have. If the employee declines the offer of modified work, that should be documented as well. Modified duties should be time bound. Charities that allow employees to continue with modified duties or hours indefinitely may be considered to have created a new position for them, which they may not be obligated to do. A good practice is to revisit and update the return to work plan every time new documentation is received from the health care provider. The goal of every return to work program should be to return the employee to full duties and hours. Keep documentation such as doctor’s notes and return to work plans in a separate file. Documentation related to the employee’s innocent absenteeism should be treated as confidential, and access limited to only those with a legitimate need to access that information. If this information is not safeguarded, it could open the charity to liability from a privacy and human rights perspective. Even after having followed these tips, charity leaders will encounter more complex situations where professional assistance is required. For example, when a long term disability claim is denied or has been exhausted, and the employee is still not able to return to work, it’s time to call a professional. Charities should look for a reputable organization that has a strong background in disability management, and should also check references before entering into any kind of a formal agreement. Members who are enrolled in CCCC’s domestic Group Health Insurance Program have access to the Early Assistance and Reintegration Service (EARS), which is designed to help employees deal with any medical condition interfering with their capacity to work. This service is provided by Cowan Insurance Group and delivered by a team of healthcare professionals. When in doubt about whether or not to engage the services of a third party, it’s best to seek advice in order to avoid exposing the charity to unnecessary liability. Thank you for the thorough review of this subject. Indeed, depending on the background of the pastor/leadership team at a church, they may not be prepared to address challenges like this one, especially when it comes to the HR and legal complications involved. Good summary, helpful, fair and gracious. Thanks. Thanks for your comments James. I’m glad to hear that you found the post helpful. If you have ideas about future topics you would like to see covered, please don’t hesitate to let me know.